The 1930s was more a decade of consolidation than of revolutionary advance in cosmology. And in the early 1940s, world war limited cosmological advance. But the war that temporarily absorbed scientific resources also promoted technologies that would lead to fundamental scientific advances. Advances in nuclear physics helped transform cosmological speculations into quantitative calculations. This line of investigation, begun in the late 1940s, was at first pursued mainly by physicists, not astronomers. In the 1930s Georges Lemaître had suggested that the universe might have originated when a primeval "cosmic egg" exploded in a spectacular fireworks, creating an expanding universe. Now physicists found plausible numbers for the cosmic abundances of different elements that would be created in an initial cosmic explosion. But the theory of an initial cosmic explosion was soon challenged by a new hypothesisthat the universe might be in a steady state after all. In 1946 the Ukrainian-born American physicist George Gamow considered how the early stage of an expanding universe would be a superhot stew of particles, and began to calculate what amounts of various chemical elements might be created under these conditions. Gamow was joined by Ralph Alpher, a graduate student at George Washington University, where Gamow taught, and by Robert Herman, an employee at the Johns Hopkins Applied Physics Laboratory, where Gamow consulted. Both Alpher and Herman were American-born sons of émigré Russian Jews. Gamow assumed expansion and cooling of a universe from an initial state of nearly infinite density and temperature. In that state all matter would have been protons, neutrons, and electrons merging in an ocean of high energy radiation. Gamow and Alpher called this hypothetical mixture "Ylem" (from a medieval word for matter). Alpher made detailed calculations of nuclear processes in this early universe. For his calculations he used some of the first electronic digital computersdeveloped during the war for computing, among other things, conditions inside a nuclear bomb blast. It seemed that elements could be built up as a particle captured neutrons one by one, in a sort of "nuclear cooking." The contribution of this theory was not to set forth a final solution but, no less important, to set forth a grand problemwhat determined the cosmic abundance of the elements? Could the observed abundances be matched by calculations that applied the laws of physics to an early extremely hot dense phase of an expanding universe? Gamow did succeed in explaining the relative abundances of hydrogen and helium. Calculations roughly agreed with observations of starshelium accounted for about a quarter of the mass of the universe and hydrogen accounted for nearly all the rest. However, attempts to make calculations for other elements failed to get a sensible answer for any element beyond helium. It seemed that piling more neutrons onto helium would hardly ever get you stable elements. Gamow joked that his theory should nevertheless be considered a success, since it did account for 99% of the matter in the universe. Indeed his theory was not wrong but only incomplete. Astrophysicists soon realized that if the heavier elements were not formed during the hot origin of the universe, they might be formed later on, in the interiors of stars. The theory depended on a special property of carbon, which British astronomer Fred Hoyle measured and found as predicted. Cosmology had entered the laboratory. Hoyle's triumph in explaining how most elements could be created in stellar interiors fell outside the theory in which elements were created at the very start. It was interpreted as favoring a rival theory. And Hoyle did favor a rival theory, which he had played a large part in inventing and developing. In this theory the universe had always looked much as it does now. There never had been a "big bang"a phrase that Hoyle invented in 1950, intending the nickname as pejorative. [nor] challenged by an appeal to observation. 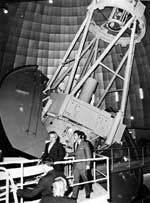 Photo of Hoyle at the dedication of the Anglo-Australian Telescope, with Prince Charles, 1974. Drawings of an early and a later stage for two different models of an expanding universe. The left model obeys the cosmological principle, according to which the universe is homogenous and appears the same to an observer anywhere in the universe. The right model obeys the perfect cosmological principle, which adds to the cosmological principle the additional requirement that the universe be unchanged over timenew galaxies emerge continually within the expanding space. 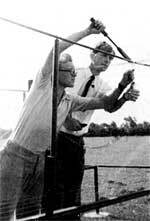 Ryle, on the right, soldering part of the antenna with his colleague Hewish. To many philosophical minds, the steady-state universe proposed by Hoyle, Bondi and Gold had a major advantage over the big-bang expanding universe. In their universe the overall density was kept always the same by the continuous creation of matter. In the big-bang universe with its radically changing density, various physical laws might not apply the same way at all times. It would be impossible to extrapolate with confidence from the present back to the super-dense origin of the universe. Tommy Gold (left) with Hermann Bondi (center) and Fred Hoyle (right), circa 1960. Steady-state theory also had an observational advantage over big-bang theory in 1948. The rate of expansion then observed, when calculated backward to an initial big bang, gave an age for the universe of only a few billion yearswell below the known age of the solar system! That was certainly an embarrassment for the big bang theory. For some time cosmologists had measured ideas against a "cosmological principle," which asserted that the large-scale properties of the universe are independent of the location of the observer. In other words, any theory that put we humans at some special place (like the center of the universe) could be rejected out of hand. Bondi and Gold insisted that the universe is not only homogenous in space but also in timeit looks the same at any place and at any time. They grandly called this the "perfect cosmological principle," and insisted that theory should be deduced from the axiom that we are not at any special place in either space or time. Hoyle was less insistent that the perfect cosmological principle was a fundamental axiom. He preferred to have theory follow from a modification he proposed to Einstein's relativistic universe, adding the creation of matter. The two different steady-state theories had enough in common, however, to be considered one for most purposes. Much of the later development of steady-state theory came in response to criticism. In Great Britain, especially, scientists gave considerable attention to elaborating the theory. Their arguments were largely of a philosophical nature, with little appeal to observation. The cosmological debate acquired religious and political aspects. Pope Pious XII announced in 1952 that big-bang cosmology affirmed the notion of a transcendental creator and was in harmony with Christian dogma. Steady-state theory, denying any beginning or end to time, was in some minds loosely associated with atheism. 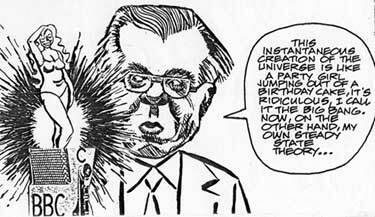 Gamow even suggested steady-state theory was attached to the Communist Party line, although in fact Soviet astronomers rejected both steady-state and big-bang cosmologies as "idealistic" and unsound. Hoyle himself associated steady state theory with personal freedom and anti-communism. Astronomers in the United States found the steady-state theory attractive, but they took a pragmatic approach. The rival claims of big-bang and steady-state theory must be settled by observational tests. One test involved the ages of galaxies. In a steady state, with continuous creation of matter, there would be a mixture of young and old galaxies throughout the universe. In a big bang, with only an initial creation, galaxies would age with time. And astronomers could look back in time by looking at more distant galaxies, for observing a galaxy a billion light-years away meant seeing it in light that had left it a billion years ago. Observations reported in 1948 purported to find that more distant galaxies were indeed older. Score one for the big bang. Bondi and Gold reviewed the data carefully, and in 1954 they showed that the reported effect was spurious. Score one for steady state. The age test might be able to distinguish between the rival theories in principle, but in practice it could not. Another possible test involved the rate of expansion of the universe. In a big bang, the expansion rate would slow; in a steady state universe it would remain constant. Data from the Mount Wilson Observatory seemed to favor the big bang, but not certainly enough to constitute a crucial test. Meanwhile there was a solution to the embarrassing calculation that put the age of a big-bang universe less than the age of the solar system. Walter Baade showed that estimates of the distances to galaxies had mixed together two different types of stars (as explained here). As a result, the size of the universe had been underestimated by about a factor of two. If galaxies were twice as distant as previously thought, then calculation with the observed rate of expansion gave an age of the universe twice as great as previously calculated  safely greater than the age of the solar system. That argument against the big-bang universe thus dissolved. The most serious challenge to steady-state theory came from the new science of radio astronomy. Fundamental knowledge in the techniques of detecting faint radio astronomy signals advanced greatly during World War II, especially with research on radar and especially in England. After the war, research programs at Cambridge, at Manchester, and at Sydney, Australia, built radio telescopes to detect signals from outer space. They dominated radio astronomy for the next decade. The program at Cambridge was led by Martin Ryle, who in 1974 would receive the Nobel Prize in physics for his overall contributions to radio astronomy. In 1951 Ryle believed that radio sources were located within our galaxy, and hence were of no cosmological interest. But over the next few years he became convinced that most of the radio sources he was detecting were extragalactic. His observations, then, could be used to test cosmological models. Ryle argued that his survey of almost 2,000 radio sources, completed in 1955, contradicted steady-state theory, because more distant/older sources seemed to be distributed differently from nearby ones. But he overstated the significance of his initial data. Only after more years of work would radio observations argue strongly against steady-state theory. have always lived in a happy state of being able to postulate theories which had no chance of being disproved. A powerful blow against steady state theory was struck in 1965 with a surprising discovery. In a 1948 paper, Gamow had argued that the big-bang universe would at first be dominated by radiation  a raging sea of energy. As this expanded the energy would mostly be converted to matter. Alpher and Herman predicted that a remnant of the radiation would remain  a cosmic background radiation permeating all space. As the universe expanded this would cool. Radiation that had initially been far more than white-hot would by now have very low energy. They predicted the temperature of the universe now should be around 5 degrees Kelvin, barely above absolute zero. There was little communication in those days among nuclear physicists, observational astronomers and theoretical cosmologists. Furthermore, the fact that Alpher and Herman were employed in industrial research laboratories may have lowered their visibility in the university research community. 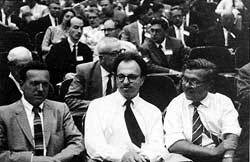 Gamow, Alpher and Herman were more interested in the physics than the cosmology. Their estimate of radiation was far from certain, and varied in subsequent calculations. Anyway, at the time they published their idea nobody could test it, for radiation of such a low temperature would be microwaves, a hard-to-detect type lying between infrared rays and radio waves. In the late 1940s, no equipment existed that could detect microwave radiation with a temperature much below 20 degrees Kelvin. Techniques rapidly improved as microwaves were found useful for radar and communications. In 1963 Arno Penzias and Robert Wilson, studying the sky's microwave "noise" for Bell Telephone Laboratories, realized that they had detected microwaves coming from all around the sky, a universal background radiation. Robert Dicke, a physicist nearby at Princeton University, learned of the measurement and in 1965 correctly interpreted it as radiation of about 3 degrees Kelvin, left over from the big bang. Dicke had not known about Alpher and Herman's prediction, and had independently thought of the cosmic background radiation. Even before learning of Penzias and Wilson's observation, Dicke had set his former student James Peebles to work on calculating the nature of this radiation. Only later was Alpher and Herman's predition recovered and appreciated. Penzias and Wilson had mixed feelings about the theoretical fallout from their discovery. Wilson, who had studied cosmology with Hoyle, later recalled that he "very much liked the steady-state universe. Philosophically, I still sort of like it. I think Arno and I both felt that it was nice to have one explanation but that there may well have been others." Few astrophysicists shared Wilson's reservations. Eager to bury the steady-state theory, already largely discredited by surveys of radio sources, they quickly described Penzias and Wilson's observation as the death-blow to steady-state theory. A note by Gamow: “I am glad to say that it isn’t necessary any more to pour Hoil on the troubled waters of cosmogony.” (Cosmogony is the study of the universe’s origin.) Date unknown. The minority who still preferred steady-state theory were not convinced that the big bang had been detected. Couldn't Penzias and Wilson's single observation have some other explanation? Hoyle argued that the radiation could come from interaction between stellar radiation and interstellar needle-shaped grains of iron. Only a number of measurements at different frequencies could confirm that the radiation had the properties predicted for a remnant of the big bang. It was not until the early 1970s that techniques advanced enough to make these measurements, bringing abundant confirmation. For most purposes, however, the debate between the big bang and the steady state was over in 1965, with big bang the clear winner. Steady-state advocates were reduced to making ad hoc arguments of little plausibility, and they were increasingly marginalized. By the early 1970s, cosmology was increasingly an observational science, its controversies and debates assigned to empirical arbitration. Yet despite the greatly improved, and sometimes entirely new, instrumentation, philosophical considerations remained at the center of cosmology. They played a crucial role in the next major development in cosmology, the theory of the inflationary universe.